Today I am going to be reviewing this very popular eyeshadow palette that has received so much attention and buzz: Too Faced Chocolate Bar Palette. My lovely friend Jess kindly let me try this out for a while because she raved about it so much and thought I would like to test it out before I go ahead and buy one for myself. 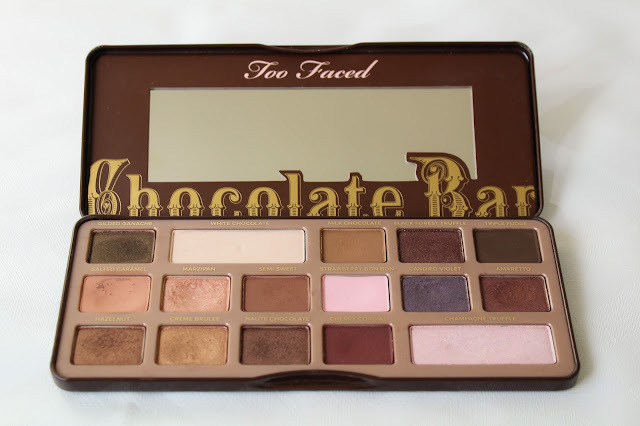 Women and chocolate have a great connection, so it makes serious marketing sense to have a palette that literally smells like chocolate heaven and wafts up to your nostrils as soon as you open the palette. I am not even kidding, I spent most of the time sniffing this when I was doing my makeup haha! Without further ado, lets get into the review of this delicious eyeshadow palette. First up, the packaging, this is probable the most adorable packaging that I have seen. I am sure that you have all seen it before, but it is shaped lile a chocolate bar, just like the name says. It also has the classic Too Face writing. This palette comes packaged with a magnetised tin and has 16 eyeshadows that are made with real cocoa powder, yes you read that right, real cocoa powder. You can even taste the shadow and it tastes like chocolate, it is that good! The inside also has a mirror and a plastic sleeve with each shadow name printed on it. By this point the smell should be making your mouth water. As you can see from the picture, there is a great array of neutral shades ranging from the traditional browns to pinks and even darker shades like the purple and burgandy shades. I also liked the fact that the lighter and more highlighter shades are larger, since realistically, they are the ones that are used more often to most looks. 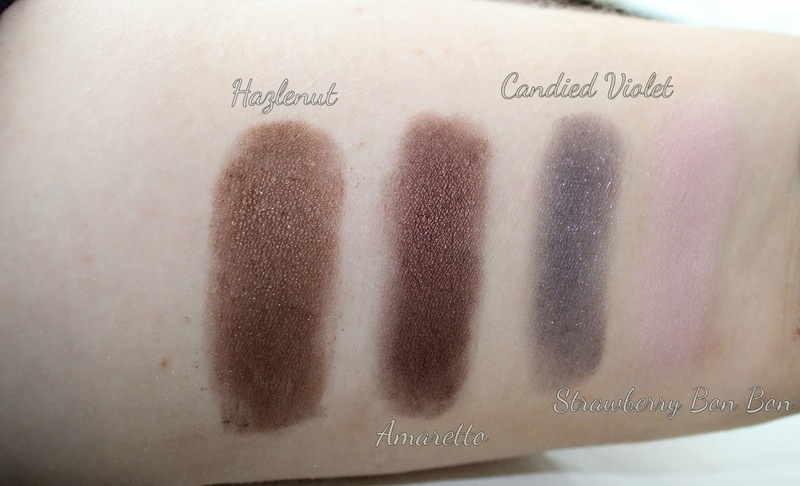 The palette has a nice balance of shimmer and matte shadows with is an A+ from me. The texture of these shadows is amazing, like seriously amazing! They are so smooth and creamy and they just glide on with such strong pigment and there is hardly any fallout or powder going all over the place when you dip your brush in. They also blend out so freaking well which makes it so easy to do your eye makeup. I was seriously really impressed with how well these eyeshadows blended out and also how long they lasted. 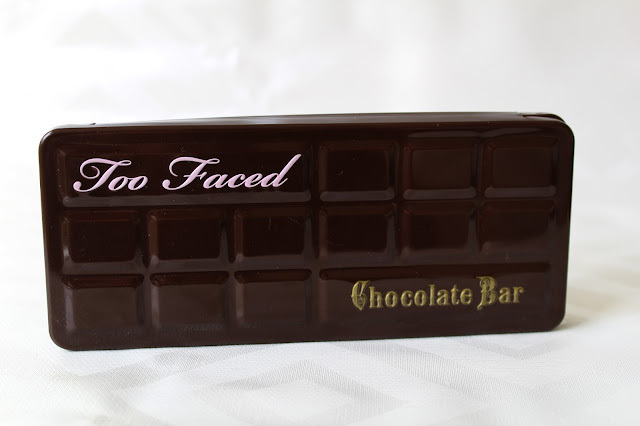 Too Faced released the Chocolate Bar Palette in 2013 and since then thy have released the Too Faced Semi Sweet Chocolate Bar and also the Chocolate Bon Bons palettes. The colours in this palette come out very rich and very vivid, both when swatched and also when applied to the lid. I haven't tried them wet yet but I know that they will look even more intense than they do dry. You do not need a primer underneath these to get a good colour payoff and lasting power, but of course a primer always helps especially if you have oily eyelids. The one thing that I love about this palette is that even the lighter shades are super pigmented, which is something that other palettes struggle with a lot. The shadows in this palette work really well with a bruhs or even with your fingers. If I am swiping the eyeshadow all over my eyelid, using my index finger makes the colour stand out a little more, however, using a flat brush works just as well. The shade Creme Brulee when applied with my fingers looks like a bronzey gold pressed pigment, which is gorgeous! It packs on a lot of colour and makes it last a little longer. 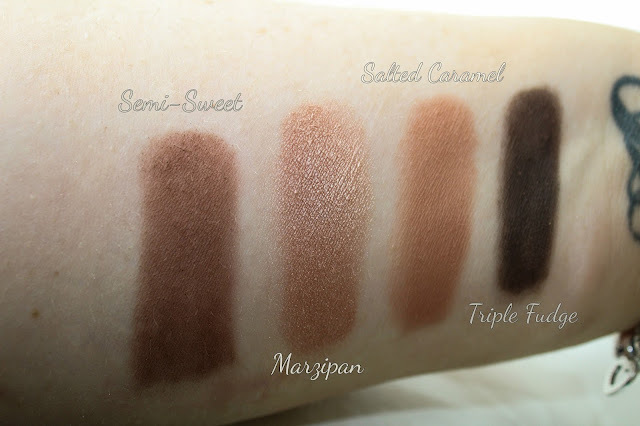 Other colours such as Triple Fudge, Haute Chocolate and Cherry Cordial are so pigmented that they are best used with a flat shadwo brush and then blend it out with a clean blending brush. I am so pleased to say that the eyeshadows in this palette lasted well over 8 hours without a primer. There was hardly any creasing and the colours stayed vivid and vibrant the entire times, bear in mind that my eyelids do not get very oily, so it might be a bit different if you have oily eyelids. 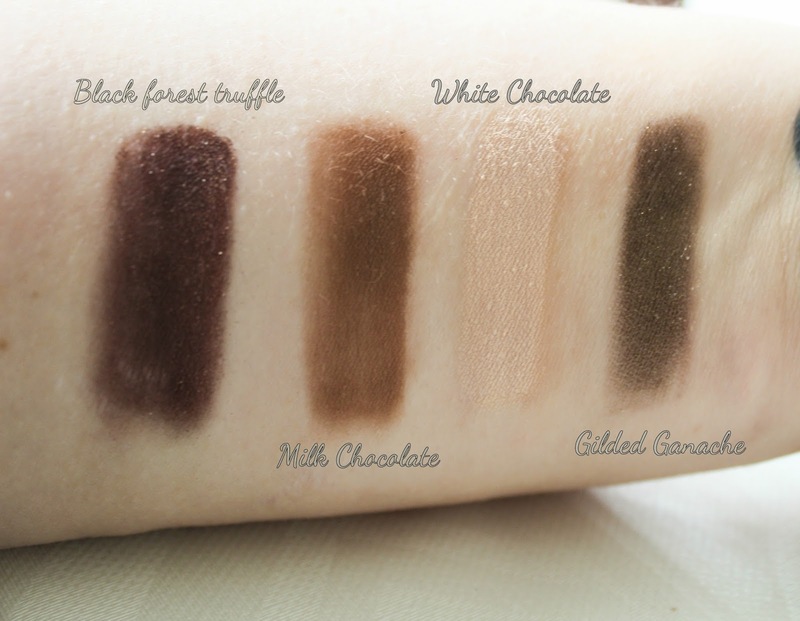 From L-R - Black Forest Truffle, Milk Chocolate, White Chocolate, Gilded Ganache. From L-R - Semi-Sweet, Marzipan, Salted Caramel, Triple Fudge. From L-R - Hazlenut, Ameretto, Cadied Violet, Strawberry Bon Bon. 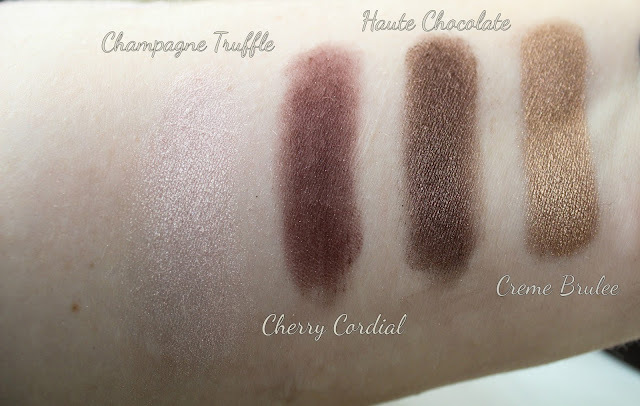 From L-R - Champagne Truffle, Cherry Cordial, Haute Chocolate, Creme Brulee. 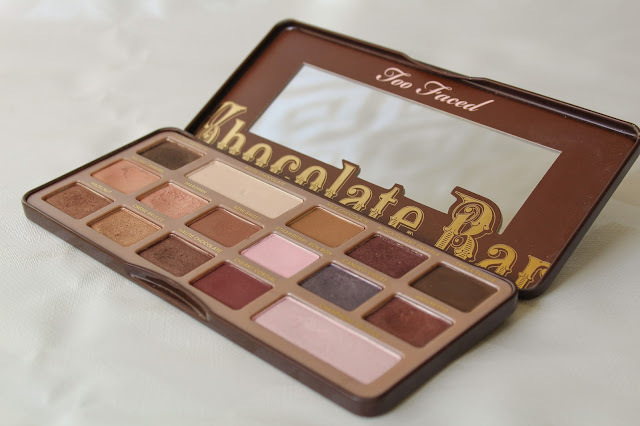 Overall, The Too Faced Chocolate Bar Palette is a solid eyeshadow palette that has become one of my favourites, even though I've now have to give it back to my friend but I will definitely be picking up one for myself soon. 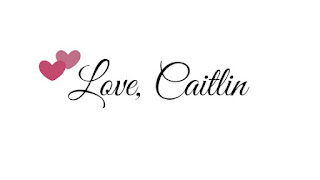 There is a wearable variety of everday shades that can take you from a day look to night look. All of the colours are consistent in texture apart from a few more glittery shades but they all blend well and are full of pigmentation. If it definitely a solid investement for someone who loves neutral colours like I do, and also the smell is enough for everyone to want to buy this! If you're in the UK then you can pick this up from Debenhams for £39 here. Have you tried this palette, if so what do you think of it? Let me know in the comments!